A parcel full of these wonderful blocks arrived in my mail box last week. Aren't they pretty? 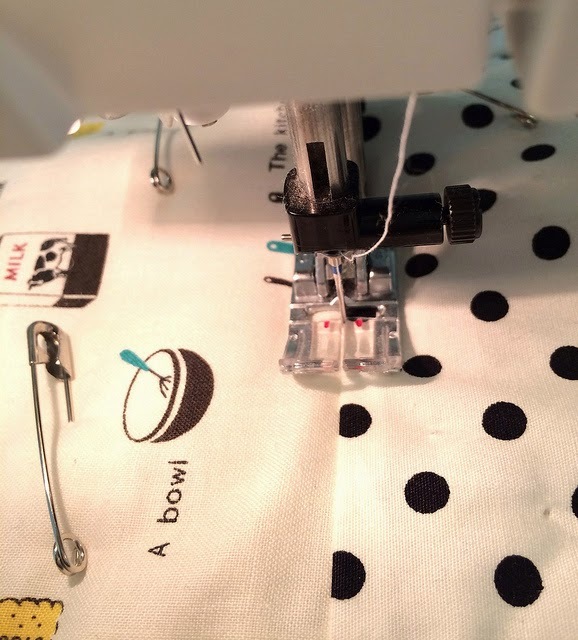 A little while ago I joined in a Nine-Patch swap organised by Barb of Fun with Barb blog. A huge thanks to Barb for organising such a great swap! She has a really clever way of making these blocks quickly and efficiently, which was handy because in the end there were 50 participants so we ended up having to make 100 blocks each!! It's really quite a wonderful feeling having a collection of blocks made by 50 different people. Imagine that! If you had all those quilters together in one room it would be quite a party! Here are the blocks I sent. 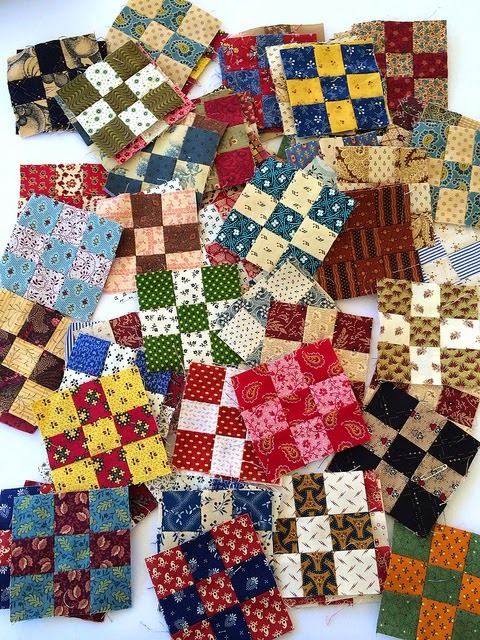 I used my civil war reproduction fabrics. I don't use them often but I have quite a stash of them. At the moment I have the repro fabrics separated in their own area but I've been wondering if I should just throw them in with the rest of my stash that I have organised by colour so that they get mixed with more modern fabrics. My hexies are a good example of what I mean. They're a concoction of civil war fabrics mixed in with 30's fabrics, a few modern fabrics, text prints and some classic spots and gingham. What a fun eclectic mix! It's more about playing with colour than being limited by an era or type of pattern. I finished sewing the hexies together today. I've decided to make two Dilly Bags. Lets hope I don't dilly dally and I get them finished and sewn into bags before too long. I also managed to get some quilting done this weekend. It's been so hot so I was glad I'd used predominantly cool, refreshing whites with black fabrics in my simple quilt of squares. *Exciting News Flash! 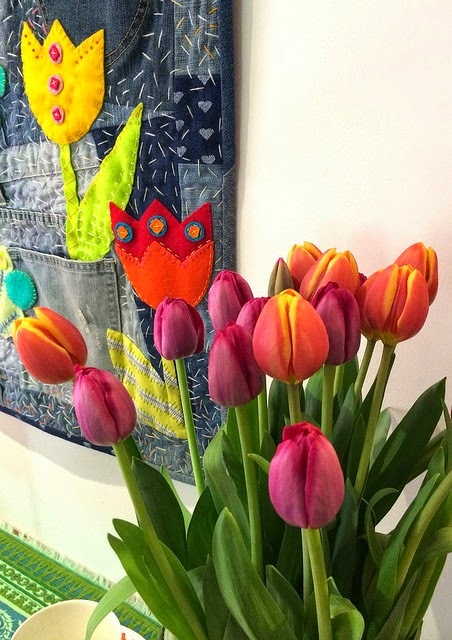 * I was very honoured to receive an email from Amy of Amy's Creative Side to say Happy As A Clam has been nominated for a Viewers Choice Award in the Bloggers Quilt Festival. A huge Thank You to all of you who nominated my quilt!! If you'd like to vote for Happy As A Clam you can do so at the Viewers Choice page. It's worth popping over to see which quilts made it to the finals. 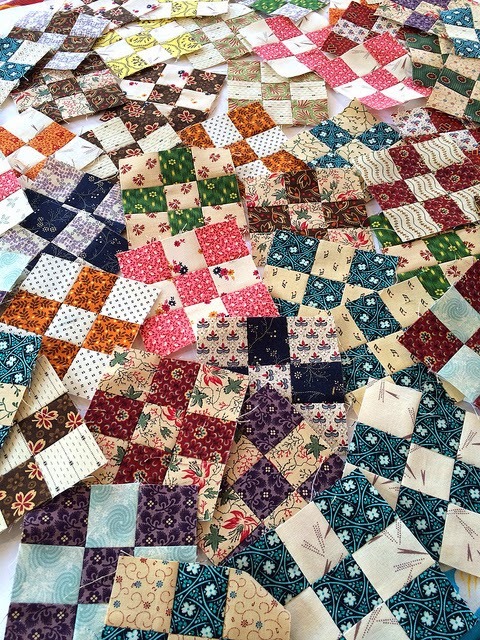 All the quilts are amazing so it'll be tricky to pick your favourites. If you feel like voting for Oi Emu in the Art Quilt category you can do that here. You can also vote for Happy as A Clam here in the Original Design category. Here's a vase of tulips to end this post for no reason other than they look bright and springy. Have a fun, colourful week! You are always a suprise and now you let us in on your secret civil war stash. They are great nine patches. It is always a challange to get the balance right with so many period lines of fabrics. Looking forward to a peek at your design wall. I love seeing how you mix things up! I am playing with hexi's now but have gone with a designers line. But when the deadlines have been meet --I will be trying my hand at mixing it up too! You are such inspiration! Congratulations on your nomination! I love your clamshell quilt and wish you good luck. One of my quilts was also nominated. Such an honour, isn't it? I love nine patches and it looks like you have a wonderful pile of them. I wonder what you will make with them! Something wonderful no doubt! It's definitely worth it, the nomination ! I've voted for it, too. 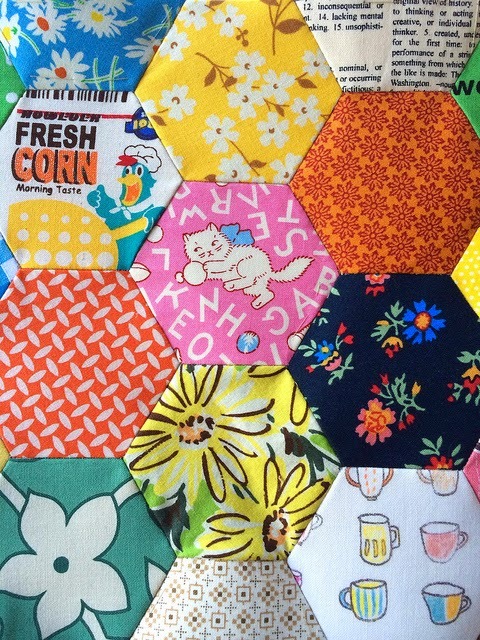 Your fabric mix in the hexies is wonderful... I love to mix different lines and styles too, it's a big part of the fun. It will be interesting to see what you make with your nine patches! Your hexies are like an eye-spy, with so many little treasures in them. Your hexies are so cute, and a well deserved nomination for the clams! hooray for pretty nine patches! I love your hexies all mixed up - they look great. couldn't help notice that you are using a regular foot for quilting. how does that work? I usually use a walking foot, but maybe I don't need to? Congrats on the nomination!! good luck with the voting. Love the visual difference between your hexies and the 9 patches, but both gloriously scrappy! You've been rather busy at your sewing machine again havent you! I've been thinking about those nine patches. They will be so fun to use. Your variety of fabrics in your hexies really work well together. I'm actually surprised and realize maybe I've been to restricted in what I put together. That is for the eye opening lesson. I love those nine patches. Can't wait to get into the loot I received. Congratulations for the nomination.. It is so well deserved. Love your hexies all mixed together. Those tulips look beautiful. Lovely picture all together. I will definitely vote for your quilt. 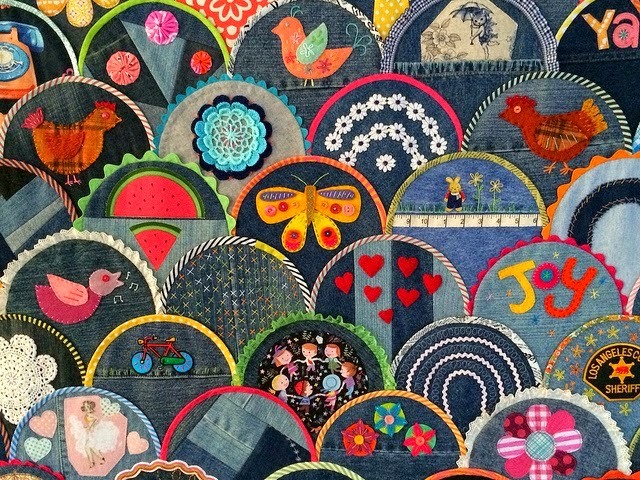 What you do with denim is so inspired and inspiring! What a happy blog post! Hexies and nine patches contrasting so wonderfully with the white and black squares! And congratulations on your nomination! Of course you have my vote! Good luck! Congratulations on the nomination! I'm not at all surprised that it was nominated. It's hard to resist that quilt. And I love the eclectic mixing of all styles. It's such a potent reminder of how we need to stay open minded when we create. Good things come of it! Grande lo scambio dei blocchi nine-patch...che divertimento riceverli nella casella postale! La tua scelta degli accostamenti di colore non finisce mai di stupirmi!!!! Congratulations on your nomination, dear Rachael! The nine patches are beautiful - what a great swap! What a lovely bundle of blocks to receive in the mail! Have fun! The hexies will be lovely in the dilly bags. Good luck with the voting. That is exciting. And the tulips are lovely! Haha -- I would have never figured you for a civil war stash kinda girl! If you figure out whether to mix the two types of fabrics, please let us know. Mine are separate for now, but I struggle with the same problem. Like you though, when I'm working on a project, I go to both piles -- it's all about the color. Love those hexies. AND 9-patches -- can't wait to see what you do with them! Oo, I am so intrigued by the different types of fabric kept spearate. I am even mre intrigued by the prospect of.mixing them, and by the black and white quilt and just what that dilly bag will look like. It is indeed a bright fun world. Where to start on this post???? I love the nine patches and very much enjoyed being in the swap, I am not sure what I am making yet either. I love your hexies for you dilly bag! Where did you get the pattern, I think it is something I need to make! I finally figured out how to vote for your quilt. Thanks for the link, I never would have found it! Those clam shells are amazing and so cool. Of course I voted for you! Your Happy as a Clam quilt is hands down the most original. 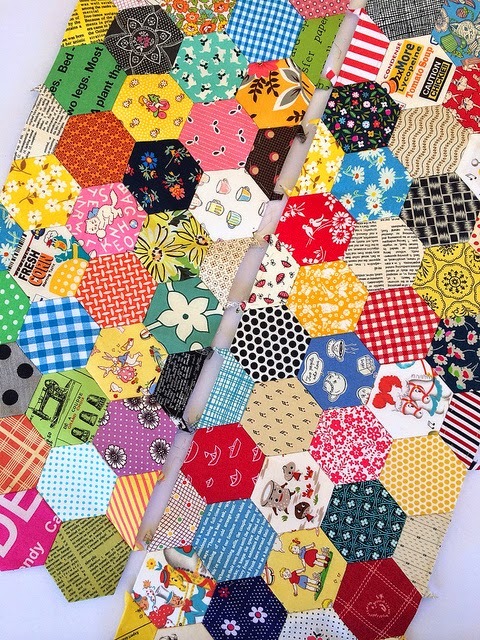 :) Love how you mixed the fabrics in your hexies. I adore when different styles are carefully blended. Makes the project very personal. Yes, I have voted for you as I always love your quilts. 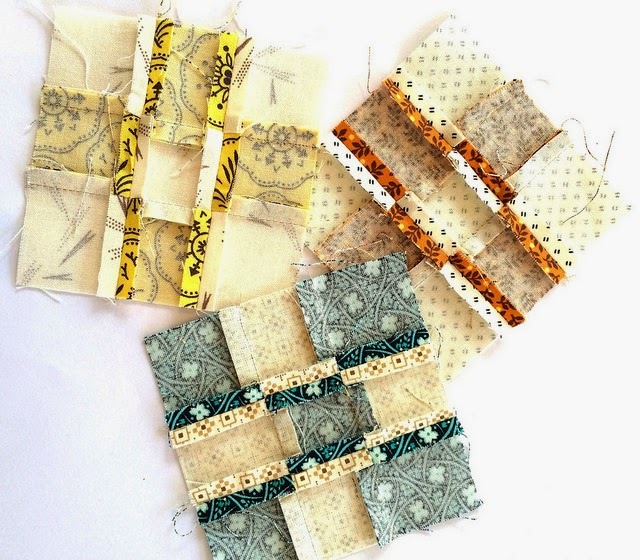 The stash of tiny 9 patch blocks looks amazing and I can already imagine the thoughts whirling about your head as to how they can be incorporated into another awesome quilt. Interesting method of making the blocks, I have added it to my "Must try that one day" list! Looking forward to seeing photos of you finished sewing studio with its design wall. Very exciting for you. I bet you won't dilly dally on those bags and they are almost done already! It is strange to think you are experiencing hot weather. It finally turned cold here in maryland on Halloween. Congrats on your happy as a clam quilt! It's a winner in lots if contests! 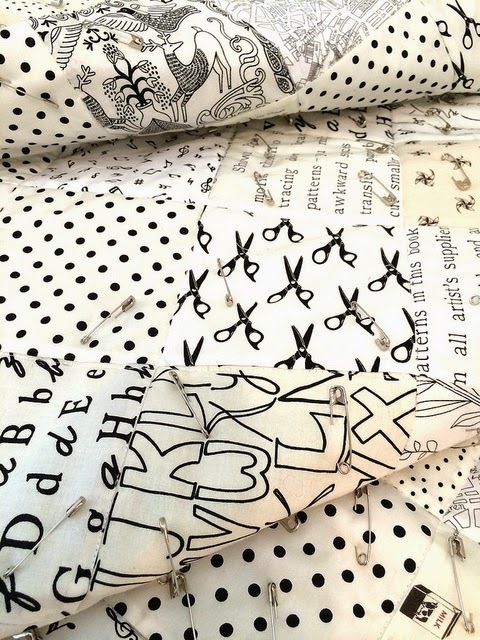 Hi Rachael congratulations on a great Bloggers write up in this Edition of Downunder Quilts.. I am so tickled to hear you have a civil war stash! Sometimes I hear less than kind comments about traditional fabrics, but you have proven that they can be mixed with modern, kitschy fabrics and it works. Congrats on the quilt! Awesome amount of blocks you had to make Rachael.....WOW, congratulations on Clam Shells being nominated...such an honour! Loving your mix of fabrics! I reckon you are a good mixer Rachael and could make any era of fabrics fit! Hi Rachael, I just landed here from StudioKat Design FB page. I love love love "Happy As A Clam" it's gorgeous. I love your blog too, it's very inspiring. I'll definitely be back. What a wonderful swap! Your dilly bags will be full of cuteness with those fabrics. My theory is that you can put anything together if it looks good to your eye. 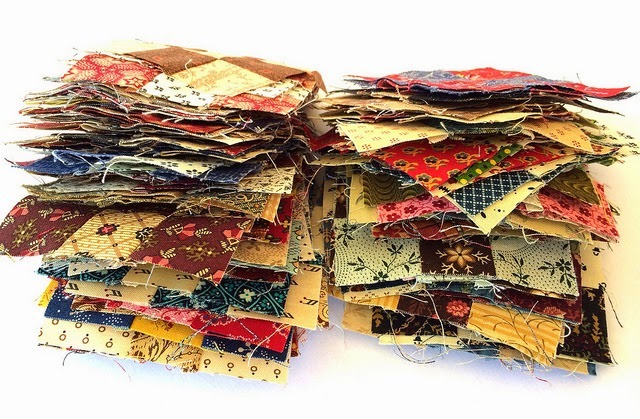 If you have ever examined Jen Kingwell's quilts she puts lots of eclectic fabrics together. I can't wait for her first fabric line to be released. Wow, you've been busy as ever, I really love those hexies! Mix away, with your skill mixing color and print it's a win-win. Thank you for the tulips. So pretty with all the snow here! Wow, what a nice collection of nine patch blocks! 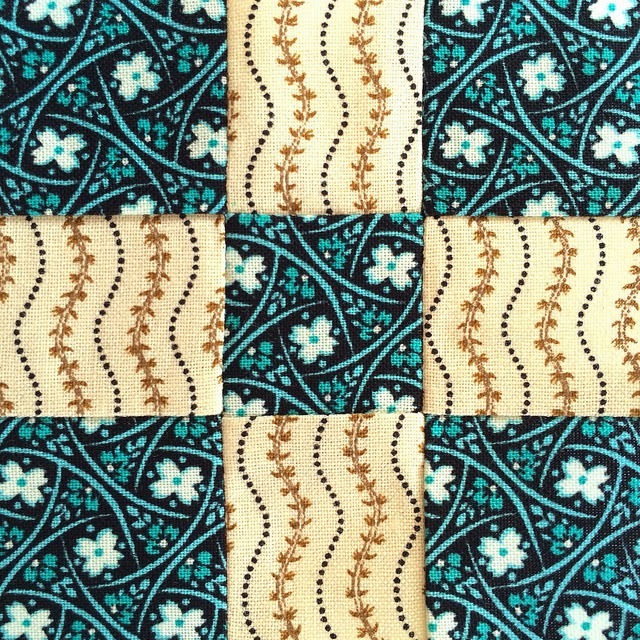 I just love the classic look to the nine patch and how neat is it that you have blocks from so many other quilters?? I like your eclectic look from blending all different fabrics together. Fun! What a busy post. Your nine patches will be fun to play with. It is such a versatile block and there is a great variety of colours in your blocks. 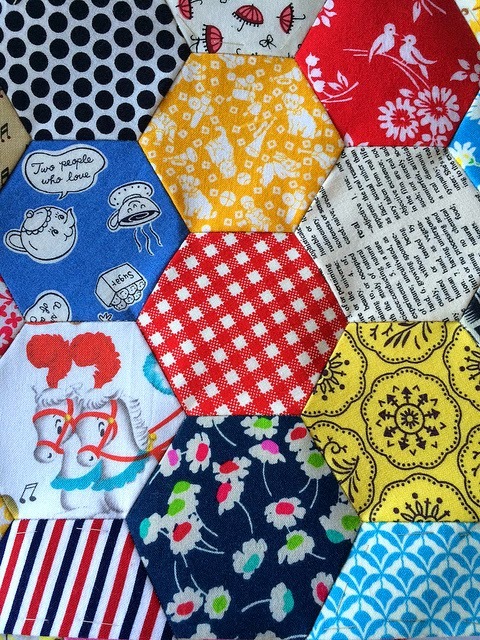 Likewise, the variety of fabrics in your hexies work so well together. Please don't dilly dally, as I'm looking forward to seeing your dilly bags. How exciting having your two quilts in the Bloggers Festival. I'll have to duck over and vote.